The Anthony John Group, creators of the award-winning and internationally acclaimed Emporium, are about to launch their newest creation in Brisbane’s Southbank. Southpoint will be the first stage of a $590 million mixed-use, transit-oriented development will launch to the public in August this year. 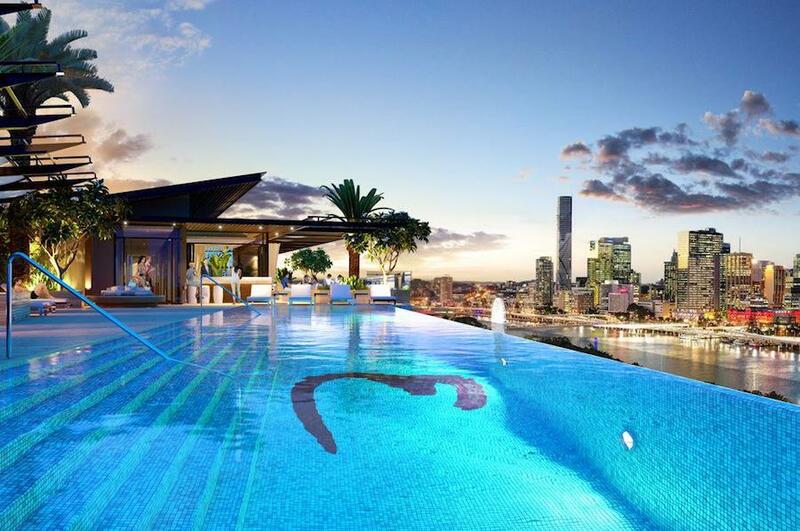 Bordered by Vulture, Grey and Tribune Streets, Southpoint will feature Brisbane’s second five-star Emporium Hotel as well as 221 one-, two- and three-bedroom luxury apartments and approximately 42,000sqm of A-Grade commercial office and retail space. The development will also include a major upgrade to the South Bank rail station, including new station facilities, ticket office and sheltered passenger waiting areas. A retail concourse is also planned as part of the development. Southpoint will comprise three buildings linked by a pedestrian plaza at ground level, which will feature convenience shopping, restaurants, wine bars, a day spa, cafes and access to the train station. The 8,533sqm site incorporates the heritage-listed Collins Place, which will be restored as part of the project and incorporated into Southpoint’s dining and retail amenity. The first stage of the development will comprise a 21-level building with the residential apartments and 146-room, five-star Emporium Hotel. The building will comprise two levels of hotel lobby/conference facilities, four levels above-ground car parking and 15 levels of apartments and hotel suites. The stage one residential release will comprise 60 one-bedroom apartments ranging in size from 50 to 59sqm, 65 two-bedroom apartments ranging from 80 to 91sqm and five 184sqm three-bedroom apartments. One-bedroom apartments will range from $375,000 to $560,000; two bedrooms will range from $570,000 to $835,000; and three bedrooms will range from $1,590,000 to $1,690,000. The second residential stage, Southpoint North, will feature an additional 91 apartments. The 146-room, five-star Emporium Hotel Southpoint will feature a sky deck with infinity edge pool, day spa, gymnasium, boutique conference facilities, restaurant and bars. All Southpoint residents will have access to these facilities. Designed by architect Jackson Teece, Southpoint apartments will feature large living and dining areas with picturesque views enjoyed through floor-to-ceiling glass. Southpoint’s kitchens will include European stainless-steel appliances, integrated fridges, reconstituted stone benchtops and smart storage options. Southpoint’s A-grade commercial office space is registered for Green Star status and includes floor plates of up to 1,600sqm to accommodate flexible tenancies. Mr John said early sales interest had been strong and that he expected this would increase with the August opening of Southpoint’s sales office, which had been inspired by the 2012 London Olympics Basketball Arena. Southpoint will deliver a mixed community with approximately 5,000 workers, residents and visitors expected within the development on completion. Early works on Southpoint are scheduled to commence in December 2013, with construction expected to commence in 2014.